Although today is the first day of autumn, and yesterday it was 100 degrees in our little patch of western Kentucky, our family has embraced the rhythm of fall for several weeks now. Spontaneous travel is done for at least a while, and Pip and I have found our way back to many school year activities. Chris is back in the studio full time, and we're starting to talk about Halloween and birthdays and the holidays beyond. This dinner happened by accident. 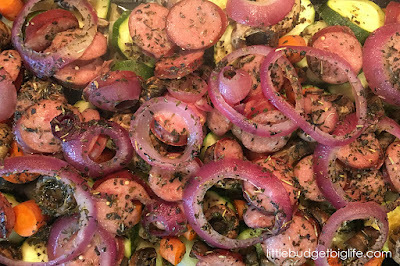 It was a concoction of reduced-price veggies and a manager's special kielbasa (read: items that better be used today). It turned out to be a balanced marriage of fresh summer flavors and comforting cool-weather foods. It was so easy. And inexpensive. And pretty. And all it left was a single dish plus a cutting board and knife to clean. I layered the following ingredients in a 9x13 glass baking dish, covered with foil, and baked at 400 degrees for 50 minutes. I called it "Baked September" because it felt like a bridge between summer and fall, much like our September seems to be. I offered a salad and some sliced tomatoes on the side, but no one took me up on it. We all just got second helpings of this instead.